I'm posting a preview of my paper on the new Decware Zen Triode NOS DAC. Something for your weekend reading! I'm hoping lots of you will come to the Decfest the first weekend in October this year and listen to it! If anyone wants to schedule a private listening session prior to then, please call or e-mail me! Weekends are fine, as are evenings! Really really enjoyed reading this, and will reread! In spite of the comments that follow, I'm very interested in this thing. Vinyl pressings from digital masters have always sounded VERY digital to me, and I really don't care for the way they sound (even though printed to vinyl). I have quite a few that I listen to regularly, as to liking the music and performance, and so on, but have an aversion to the texture of the recorded sound. The vinyl pressings from digital masters I have are not quite as metallic/edgy as cd's, on the one hand, but nevertheless they've never sounded as "even" as analog mastered recordings to me. I can tell some frustration was vented upon that bad, bad, CD player. ;D I'm sure you tried every imaginable idea, but why have you decided upon parallel DACs rather than other options, a step-up transformer for instance? paralleled chips increase the bit rate and reduce errors. Very interesting. I hope there's a market for this! It's going to be EXPENSIVE and your friends and customrs are a bunch of cheapskates. For me, the full unit would likely be overkill. Probably MY favorite version would be one that was stage three with two Coasxial inputs. The funny thing is that I'm finally at long last happy with my digital again, and I'd be loathe to rock the boat. Something in the Sony I'm using (and I'd suspect it may be the DSD processing) is damned right. What transports are successful with this/are recommended for this? Very interesting. I hope there's a market for this! It's going to be EXPENSIVE and your friends and customers are a bunch of cheapskates. Yes, I'll be personally hand building these one at a time. As I continue to develop the individual blocks I should be able to come up with a more cost effective way to package them all together at a lower price. Meanwhile for those who would benefit from a great sounding tube preamp combined with a great sounding and versatile headphone amp and a new DAC with USB capability, the price won't seem so out of line. Or for those really serious audiophiles who require the stunning amount of control over how it sounds... One thing you can be sure of, I wouldn't have wasted my time on something unless I was somewhat certain it would sound better than anything else you can buy for the same money. By the same money, I mean the price of the item before it goes to the dealer. So I'm hoping this becomes a unit that once you spend a night with it and discover all the knobs and switches and what they do, you'd sell your boat to have one. So while you're right, and 90% of you will have no interest in it because of the price, it allows me to set my benchmark in the DAC world and continue to develop less expensive implementations of it. This unit is reclocking the Coax and Toslink inputs so it will perform better on a cheap transport than a unit that is not re-clocked. That said, I will not be recommending transports or getting in any way involved with them. It will be no different than any other DAC,. the better the transport the potentially better the sound. I will be recommending USB or a hi-end sound card for the computer with digital output feeding the DAC. As you enjoy your 1000's of CD's through whatever transport and this DAC you can take some of your favorites and get an error free wav file on your hard drive and play it back with foobar using the appropriate plug in for bit for bit output and listen to it. The sonic result will in many cases motivate you to start archiving your CD collection. Besides, CD's don't last forever. As the plastic ages they develop errors. I have absolutely no interest in hard-driving my cds etc. Zilch. Nada. And that is not going to change. I tried to chnge that. I really don't play favorites over and over . . . . And a lot of my favorites nowadays are SACDs. That is good sound. I'd want a basic version. Having too many options, tweaking. . . I just can't get into that any longer. I want something that I can say "this sounds good for almost anything" and then just spin music over and over. That's where I might be falling from the fold, I'm not that inten on tweaking til every drop is milked and reveling in the really great sound (only). Very interesting, I'll definitely be wathing. Well, I'm still very anxious to hear impressions regarding this beast. If I could, I'd be at the Decfest, but as a San Francisco-ite and heavily obligated during that time it's never been possible through the years to get there. Looking forwards to impressions fr Decware-festers! Yes, I'm also very interested in hearing further info on this unit. I particularly want to hear A/B comparisons with the ZCD's DAC. I see the board from the Zen Head in there. Is this the add on I need to grab for the direct bit for bit playback? foo_out_ks, Kernal Streaming support version 1.2.2 ?? Is Exact Audio Copy still the recommended software or does Foobar have a component add on that will allow archiving of error free files? Exact Audio Copy is for the ripping to the hard drive, error free and the Foobar is for play back. I tried going through Google and I had a problem getting to EAC myself, keep trying it. Looking forward to the Zen DAC's development. Do you have any thoughts as to the price brackets of the DAC with various stages? I understand (in a sense) a little better now. You can blend all three of these "blocks" together. Thanks, I was able to find a working mirror to DL EAC from. Steve--would you rate the headphone amp performance of this DAC over the CSP2? Also, if I understand you, the headphone and preamp capabilities would operate off of the third, solid-state, block? Totally interested in this. 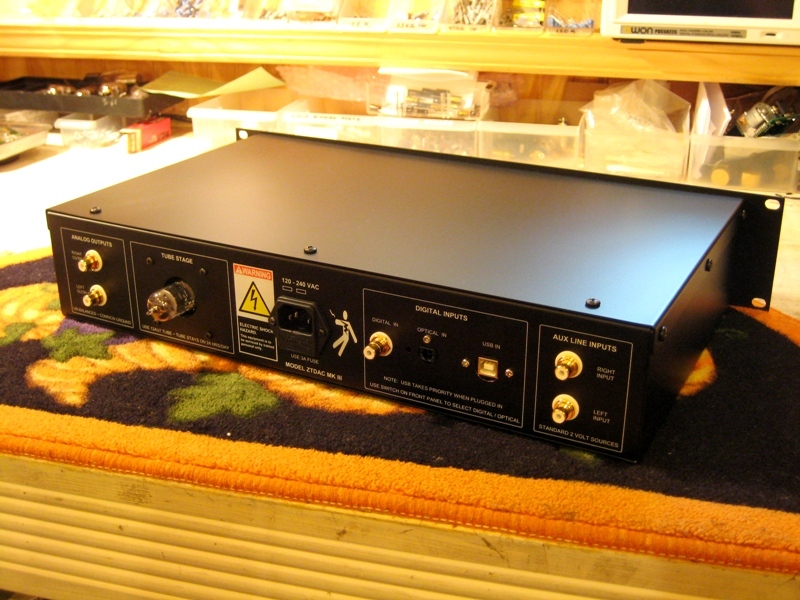 I was about to buy the CSP2 as a headphone amp and then upgrade my source. Might be able to do it in one step now. If I go back and forth between the CSP2 and the new DAC, I have a hard time deciding which is actually better. Although they sound somewhat different from each other, I think the sound quality is the same on both. The solid state block , or final, is what drives the headphones, yes. I can see with your design that you've built the ultimate with a lot of options to tweak the sound to compensate for differences in recordings and tastes, etc. But I can see maybe an additional simpler (and also less costly) product that basically consists of your DAC supporting USB and coax and your tube gain stage with a control for attenuation. I've built a home setup currently based on the Monica USB DAC and your ZKit4 & ZKit5, I can tell you that simple setup sounds really, really good. I think your ZKit4 & ZKit5 alone do alot for the sound. steve, curious if you've heard some of the nos dacs out there that have used this 8 chip in parallel design with 1ppm txco reclocking chip...valab, gigalab, dac ah, audio mirror, etc...? except the output stages, anything you're doing differently that beats the crap out of those in your implementation? steve, curious if you've heard some of the nos dacs out there that have used this 8 chip in parallel design with 1ppm txco reclocking chip...valab, gigalab, dac ah, audio mirror, etc...? Yes, I've been trying them out for the past year. Of the 8 chip models the Gigalab MK I was the best I had found for the money. It had a minor issue with clipping on the digital input side that has been mostly resolved with the Mk II, however the unit seems to have lost a tiny bit of ground in sound quality, but still recommended. except the output stages, anything you're doing differently that beats the crap out of those in your implementation? Not really no. I haven't put any of the DACs into production yet, but when I settle on what will go into production, the biggest thing will be component selection, execution of the board, soldering skills, and consistency. It would be nice if you could stick something like a Gigalabs in the front end of a DAC project and take it into production because it would dramatically lower the cost. Problem is consistency changes from unit to unit. The 12 DAC chip approach would tweak my interest in this. It would also have the added advantage of differentiating itself from the other TDA1543 NOS DACs on the market. 2) The reason for creating an output level of 10V when the most amps are full power at 2V. I would value a tube headphone amp more than the massive gain. "As you enjoy your 1000's of CD's through whatever transport and this DAC you can take some of your favorites and get an error free wav file on your hard drive and play it back with foobar using the appropriate plug in for bit for bit output and listen to it. The sonic result will in many cases motivate you to start archiving your CD collection. Besides, CD's don't last forever. As the plastic ages they develop errors." I only have hundreds not thousands of CDs, but that still makes it a long time to upload to a PC hard drive. I use software like Real One to copy onto a hard drive now. I would prefer software that is faster and still accurate enough. I also expect to move to an Apple laptop. What my point is though is I started buying CDs maybe 20 years ago. They all are still working fine. I have gone through lots of computers since then mostly by crashes and losing all my data. The idea that PCs are better long term storage devices versus a compact disk is not one I am sold on. I really don't want to combine my computer and stere system, and won't. Among other things , I value the album covers/liner notes! I keep imagining we'll see news of Steve's machine any day. If he offers one with two coaxial digital inputs I'll be tempted. As long as it is in "Decware price zone." I doubt the new DAC will be in the typical Decware frugal price range. I do believe that the product will be fantastic for whatever price range Steve can get it to. I am anxiously awaiting for the DAC to hit the market. I think his idea of stacking the chips is a clever one, but I have to wonder about the signal of the top chip having to pass through all those consecutive solder joints. If I understand correctly, the extra paralleled chips give more amperage to the signal. I was under the impression that sometime after the fest, we would get to know the pricing. Has it been announced? I had the same concern so I did one with each chip on a circuit board. Between the traces on the board or the stacked chips I couldn't hear the lessor of two evils. I haven't made any announcements yet on the price, but am starting to write the final papers and get it installed on the site. I'm still working out the final pricing. Steve, have you considered the "Asynchronous Mode" for the USB implementation? The adaptative mode is the typical implementation of the USB Dacs in which the source transmit the data based on its clock. With this way the DAC has to reclock the timing to reduce the incoming jitter but not in a very satisfied way. But with the Asynchronous Mode, the clock of the source becomes slave and the timing is controlled by the DAC's clock. In other words, total synchronization and the jitter is widely reduced (by 100 times lower I think). Yes, the USB implementation is asynchronous. I've been real busy since the fest so I haven't done any further work on the DAC except to listen to it daily - and with different amps each day. I'm at the point where I'm just trying to make sure I'm really done or make sure there isn't anything else I could do to make it better. Meanwhile I have improved the ZCD player by a respectable amount so that it is no longer embarrassed by the DAC sonically speaking. Well Steve I am very excited about you developing a NOS DAC. I grew up in the age of CD, so going down the vinyl path would mean I would have to replace my whole music collection and the CD players I've heard don't sound as good as vinyl for sure. Recently I bought a relatively cheap NOS DAC and it just sounded so much more like live music than my previous players/DACs, so I am pretty convinced this is the way I will be going. Sounds like your DAC will be a piece of kit to be reckoned with. Like some of the other replies I probably won't be able to afford the whole DAC you are proposing but if you do develop modules later I would be very interested. As most of you know the NOS DAC that started this thread is a one-off that I've been developing for myself as my personal DAC. It's too elaborate to put into production (nice way of saying it's too expensive to get a reasonable return on the investment after I buy the parts and chassis to build 100 of them). 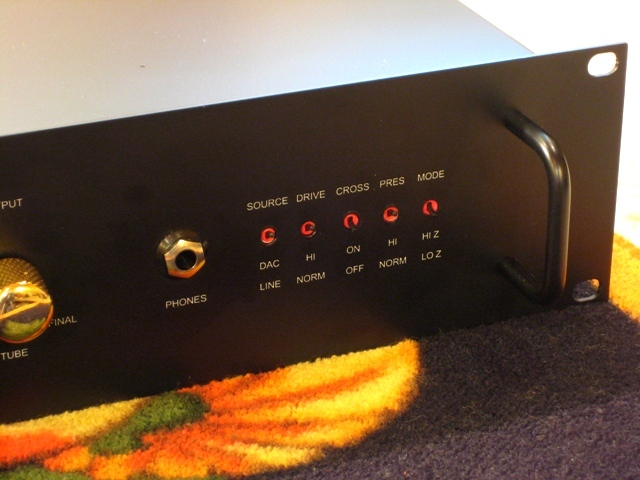 The Zen Triode NOS DAC is a 3 block system. We've talked about perhaps making it available as separate blocks so that people could purchase one block at a time, or only those blocks they felt they needed or wanted. I've been working on such a concept ever since October. At the same time, I've been exploring other paths to reach a similar end result in my R&D. NOS sounds good to me because it is more phase coherent and lacks the typical dryness oversampling brings. 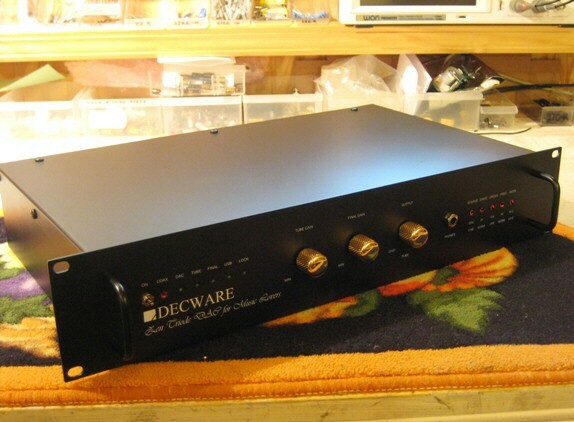 However we all know there are many great sounding DACs out there that use some oversampling... WADIA comes to mind. Jitter is the main enemy in both formats and can bring either one to it's knees. And honestly, any format is subject to it's implementation and voicing. The NOS chips I used are the simplest 20 year old design available - so just to add credibility to the result I decided to try the newest DAC technology today and see if by setting it up right I could get similarly pleasing results with oversampling against my reference NOS dac. This is what I've been up to lately. Just the opposite of the Zen Triode NOS DAC I am developing a 24/192 up-sampling design around the Cirrus Logic's flagship hi-end chip. This has an advantage over my reference dac in that USB is now compatible with 24/96 bit for bit output and further up-sampled to 24/192. To my surprise the results are on par with my reference dac, and a more usable product. So I have moved to working on the 3 piece block approach and have come up with a chassis that will match the ZBOX chassis in size and finish. We will be making a ZBOX that is configured as a gain stage (same thing I have inside my reference DAC) and calling ZBLOCK-2. The ZBOX itself will be re-named ZBLOCK-3. The dac will be named ZBLOCK-1. This way you will be able to purchase the DAC alone, and add the tube gain stage or the tube buffer stage or both at any time and all three pieces will match and fit on an 18 inch shelf. I hope to have this stuff on the site and ready to take orders in the next 30 days if all goes well, or shortly thereafter if not. 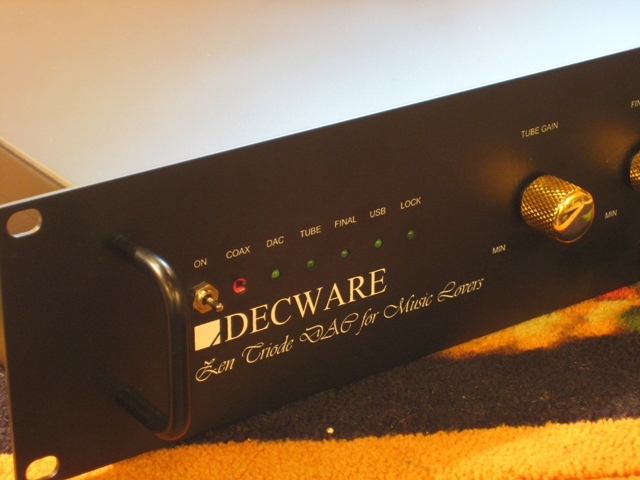 The DAC itself will sell for less than a grand and each optional tube stage around 500 each. I'll also be putting my original reference NOS DAC on the site should anyone want to pay me to personally hand make them one. Final note on what I'm hearing. When comparing the 24/192 dac to my reference NOS dac the following is what takes place: I mostly use the USB on my reference DAC and it only works with 16/44 on USB even though the dac is 24/96. And when I listen to my reference dac I can switch between the DAC alone, DAC plus tube stage, DAC plus tube stage and buffer stage. The DAC by itself is very transparent but not exactly liquid. I enjoy going back and forth for my own amusement but 80% of the time I have all three stages (blocks) active and the main reason is the smoothness. Now that I'm in the final weeks of evaluation and voicing of the 24/192 dac I have not yet let myself listen to it with any further stages, only the dac by itself. I find that the upsampling everything including the USB to 24/192 is as smooth and liquid sounding as the NOS dac was with all three stages. While the big shoot out hasn't taken place as of yet, there's more than a good chance this will actually be better. Well, I've had a brief shoot-out between the upsampling dac and the NOS dac. To make the comparison is difficult since I can't set both up exactly the same way. The NOS dac is 12 DAC chips in parallel giving it excellent current to drive an amplifier by itself. The upsampling dac is a single chip that requires a gain stage and buffer to accomplish a similar result. What this really comes down to is the comparison between the NOS dac with the tube stage engaged against the upsampling dac's two OP AMPS. I spent a fair amount of time selecting the op amps for the gain and buffer, each one different. Listening to the NOS DAC by itself with no tube stage is excellent about 1/2 the time, the other half of the time it sounds better with the tube stage and even the final stage activated. Comparing then the NOS dac by itself with no tube stage and the upsampling dac by itself, the upsampling dac is better because it has the buffer. 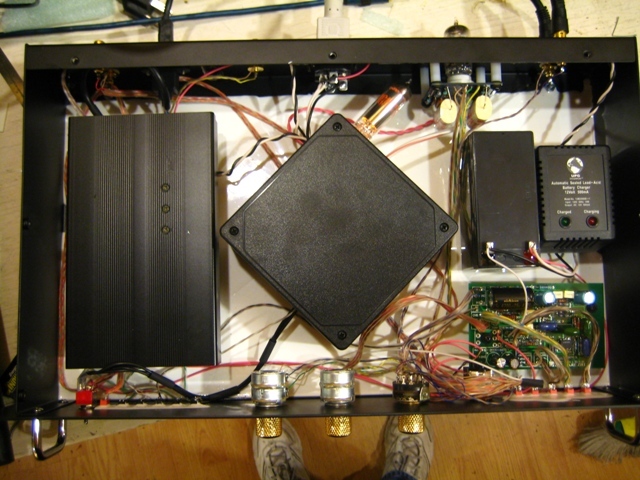 When I add the tube stage I used in the NOS dac, the sound changes, a bit more musical, a touch less resolution. This is not so much the case with the NOS unit. I will have to design the tube stage specifically to compliment the oversampling dac to get similar results. And I will. Bottom line is that I have actually been enjoying the upsampling dac by itself with similar satisfaction to what I was getting from the NOS dac with at least both additional stages activated. For those who heard the NOS dac at the Decfest this year, you understand this is rather significant. When I compared my NOS dac with both stages activated and adjusted perfectly to where I'm really getting off on the sound quality I switch it to the new upsampling dac by itself and it hangs right in there, but with more transparency. This is what my confidence is keyed on. So I continue to move forward. Chassis will be here in another 4 weeks with any luck and then I'll be able to take pictures and make the web page. I've changed my mind on the BLOCK1, BLOCK2, BLOCK3 naming scheme. The dac performs so well on it's own, that I don't want to indicate a need for more with it's name. I called it the ZDAC-1. This way I can also leave the name of the ZBOX alone. I'll just do the gain stage and call it the .... something... I'll figure that out at the last minute like I always do. The thing is, all three components will be the same size and visually match each other. The ZBOX and the Gain Stage will be optional. Using the gain stage will simply add a touch of tube joy to the sound and give you control over the dynamics. The ZBOX will have little effect on dynamics but will relax the presentation and make the system as a whole more forgiving of less than top notch recordings. Interesting. Thanks for updating us Steve. A few questions from the easily confused. So if I have a Zbox (new zblock-3) then I am 1/3 of the way to having the complete DAC system? The zblock-1 (DAC) has a solid state output and you need to buy zblock-2 to have a tube output stage? How is the zblock-1(dac) connected to zblock-2 (tube output stage)? However it works out, I want one. Will the Zblock-1 or Zblock-2 still have a headphone output? I've updated my previous post with more developments. So far none of the 3 pieces have any provisions for a headphone jack. As for connecting them together, the intension is standard RCA jacks. Thanks for the update. Its sounding pretty interesting and the separate components will make it more in my budget (I hope). What are you using as a source for the DAC? I notice that in May last year on this post you wrote about getting the kernel streaming for foobar. I have been fiddling around with different software players and find the WASAPI component for Vista and windows 7 sounds better on my system. Also I tried a programme called 'XXHighEnd' which sounded better than foobar. There was another player I found called 'playwasapi' but I couldn't get it to work. Have you tried these out? What did you think? Have you found any better players?